Now that I have decided to stop working for an indefinite period of time--I will no longer be needing daycare for my little guy. I have very mixed feelings about this--I absolutely love our daycare; the teachers are wonderful and my little guy has so much fun at school. Daycare has really helped him develop in so many ways-- he learns from the other kids and he interacts on a social level with children and other adults. All of those things are so important for toddlers. On the other hand I am going to be happy to have him home again and not have to rush him off to school three days a week so that I can get to work on time. Regardless, we will miss the center and all of the friends we have made there. 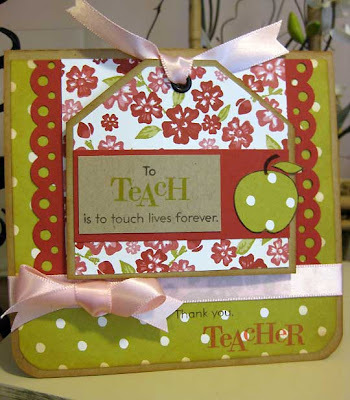 I have been working on a few thank you cards for his classroom teachers. How can you really say thanks to someone who has taken such good care of your most valuable possession? Well, I'm sure there are better ways, but a handmade thank you is a great way to show that I am truly grateful. What I love the most about these cards are the sentiments, which are just so heart rendering and meaningful. 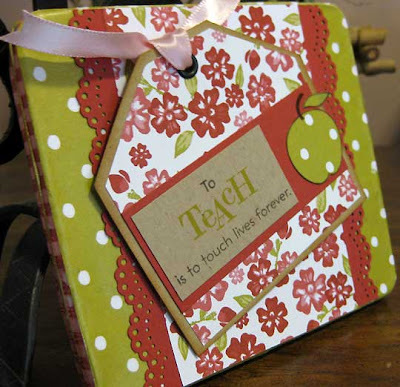 The stamps that I used are Papertrey Ink's Teacher's Apple set. I bought this set a few months ago knowing that it would be one that I would return to again and again, especially when my son is in school. Instead of just simply stamping the sentiments on the inside of the cards, I created a magnet that was part of the cards design and which included the sentiment. A few of the magnets fit inside of a pocket, while the third is attached by another magnet that I placed under the patterned paper. 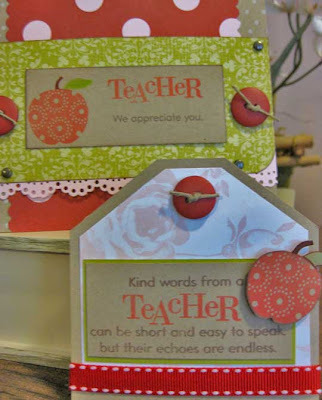 The magnet simply offers another way for the teacher to enjoy the card. Hopefully, the teachers will put it up in a place where they can see it everyday. Not only will it remind them of my little guy, but just why they were drawn to teaching in the first place. The gift box is actually a re-purposed cigar tin. My hubby likes to indulge in the occasional cigar, so it's not too often that I get my hands on one of his empty tins. I've never actually re-purposed a tin before, so I would like to think of it more as an experiment than something I will actually be giving to the teachers. The main reason for this is that I went a bit crazy with the Modge-Podge glue. Not having experience with it, I laid it on a bit too thick-- a mistake I won't make next time. Otherwise, I am happy with it and it's perfect to adhere the magnet to and a gift card fits perfectly inside. I definitely plan to list similar cards and gifts in my Etsy shop sometime by the end of the month, just in time for the end of the school year. I am also planning on putting together a few book mark cards, using the same stamp set and patterned papers. 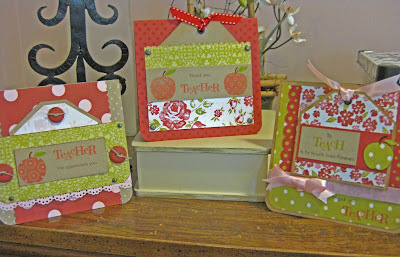 Some of the other supplies used on this project are; Cardstock- Kraft (Papertrey Ink) Kiwi Kiss and Riding Hood Red (Stampin' Up! ); Patterned Paper- Bella Rose Collection (Stampin' Up); Stamps- Polkadot Patterns (Papertrey Ink); Fibers-Pink Satin Ribbon (Papertrey Ink) Red Saddle Stich Ribbon (American Crafts). Ink- VersaMark, ColorBox White Pigment Ink; Other-Buttons (Making Memories). Border Punches (Martha Stewart). I love them Tina, they are very cute!